On Sale Now! 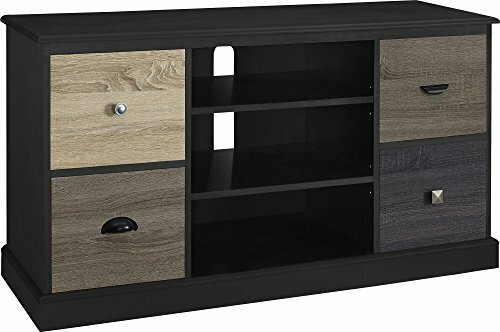 Save 10% on the Ameriwood Home Mercer TV Console with Multicolored Door Fronts for TVs up to 50'', Black by Ameriwood Home at RVTE. MPN: 1739196PCOM. Hurry! Limited time offer. Offer valid only while supplies last. The Ameriwood Home Mercer 50” TV Console is the perfect accent piece to make your entertainment space pop while providing valuable storage space. The Ameriwood Home Mercer 50” TV Console is the perfect accent piece to make your entertainment space pop while providing valuable storage space. The 3 open cubbies are ideal for media players and decor, and 4 drawers offer concealed storage for movies, games and cords. The multicolored drawer fronts are the defining feature. Each has a different woodgrain finish and knob. While all the drawer fronts complement the console’s black frame, the varying colors create an irresistible look. Fashioned from laminated MDF and particleboard, the console has a sturdy, reliable build. The console measures 25”h x 47.5”w x 15.7”d, and it holds flat-screen TVs up to 50” wide and 80 lbs. in weight. Two people are required for assembly. View More In Television Stands & Entertainment Centers. Leick 82386 Mission Corner TV Stand, 56"